Although some may say it has a worm pattern, its capabilities go beyond the boundaries of bait due to is simplicity. The slight pulsation the “Manic Movement” it creates is like no action seen before, mesmerizing number of species in even overfished conditions. The lure`s buoyancy, weighing, volume and body shape have been delicately adjusted. 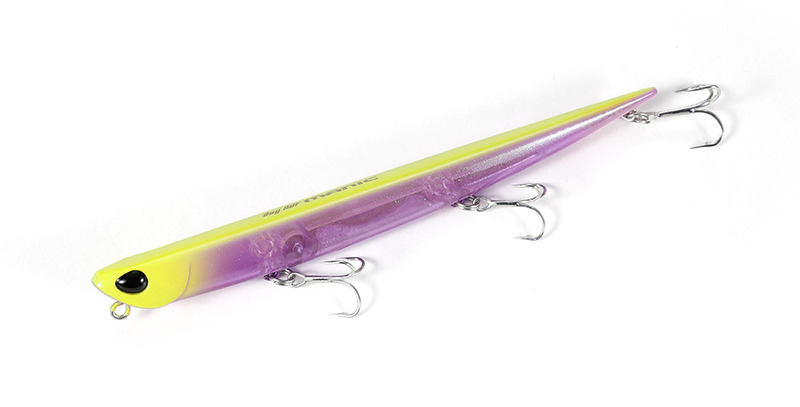 The action created by this sensitively balanced lure is a tight rolling only. There is no wobbling or sinusoidal action. The rolling action is so tight that some anglers will not even think it is moving, rest assured it leaves a vibrant wake even at the slowest of retrieval speeds. As soon as you initiate retrieve, the lure will float to the subsurface and create an exquisite wake. The tight rolling action will add a weak but unique swell in V shaped wake, appealing more efficiently to game fish. With some twitching and jerking of the rod, the lure performs an irregular action reminiscent of the baitfish on the surface. A creative angler can find myriad of use for this lures.